Concerns in Fortrose over damage to buildings and garden walls by the amount of heavy and conjested traffic having to use the villages High Street. Community Council Chairman, Tom Heath in the centre of the village. Picture by Sandy McCook. Residents of a historic Black Isle town say that traffic congestion in their High Street is causing serious access problems for emergency vehicles. 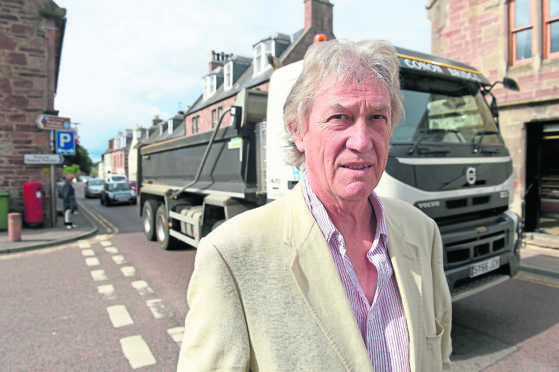 Fortrose community councillor chairman Tom Heath cited an incident on July 9 when a fire appliance was called to an emergency at 10am but was unable to access the High Street from its base in Station Road. Mr Heath said: “The fire engine was forced to reverse some hundred metres back to the fire station and then out again using a convoluted and time-consuming route to the emergency. It’s not the first time this has happened. Mr Heath added that there had also been instances with ambulances unable to get through the town’s narrow streets due to congestion. He said the situation has been growing steadily worse with house construction projects, and pressure from large farm vehicles, tourist buses and campervans. He said: “There is a housing development still to be built, and now we hear the Co-op wants to move from its current site to Ness Road and possibly use bigger transporters for their stock. A police spokesman said: “It is important that all road users show due care and consideration for other road users and do not allow their vehicle to obstruct the road. Fortrose fire station manager Ricky Dibble said last month’s incident was not a one off, with fire appliances struggling to get out to jobs on a few occasions. A Scottish Fire and Rescue Service spokesman said: “We would ask members of the public to always be mindful when parking their vehicles, and to be considerate of any potential obstruction to the emergency services.